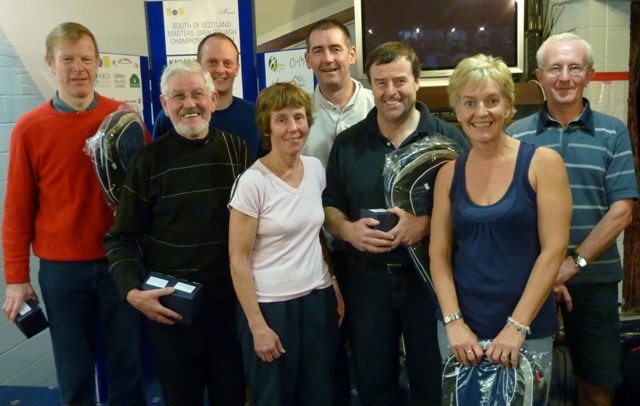 Last weekend nearly 80 competitors braved the elements to participate in the inaugural South of Scotland Masters Open Squash Championships held at Dumfries Sports Club at Nunholm. The tournament was well-supported by local and regional players who comprised a quarter of the competitors and on balance Nunholm Squash Club performed well taking 4 titles out of the 11 up for grabs, 3 runners-up spots and 2 plate titles. The local winners included Sue Strachan in the O-35 ladies event and Faith Sinclair who won the O-50 ladies title in a thrilling and close 3-2 final. In the men’s events Nunholm’s “old” boys saved the day with Davy Rogan winning the O-75s and Abbie Robertson the O-70s with Davy Rogan as runner-up. In the O-45s current Scottish Champion Jimmy Wells put in a brave performance in the final but went down 3-1 to Tony Hetherington from Carlisle. In the O-50s Malcolm McCubbin after a lengthy 3-2 semi-final win found the going too tough against Neil Rayner, a current Scottish Internationalist, and lost in straight sets 3-0. The men’s O-40 and O-55 plate competition finals featured all-Nunholm line-ups with John Thin clinching an unexpected 3-0 win over Garry McKean in the O-40s. The O-55 plate final featured Raymond Kirk and John Glendinning. Kirk took the first two sets but a determined fight-back by Glendinning levelled the match at 2-2. In the deciding fifth set, Glendinning took an early lead but Kirk hung in and finished a 3-2 winner. The final match of the O-35s round-robin pitted Simon Boughton against Mark Ford with Simon emerging victorious in straight sets to clinch the title. The men’s O-40 final featured Craig Thomson and Kevin Mackay with Craig also winning 3-0. The O-55s final was between Ernie Cowell and Eric Donohoe with Ernie maintaining his rankings lead with a 3-0 win. In the O-60s final, Peter Wilson ran out winner in straight sets over Alex Sinclair who appeared to have given it all in his five-set semi-final. Ron Pearman narrowly emerged victorious over Bob Drummond in the O-65s round-robin whom he had beaten earlier on Saturday 3-2. Aside from the competition, Ron Pearman won the Marker’s Racket draw; Norma Gregory won the hamper in the Lucky Entry draw and Roslyn Stewart the squash-bag in the junior squash raffle. The club would just like to thank all the competitors who made the effort to come to Dumfries to support our inaugural Masters tournament and hope your journey home was safe and uneventful. We hope you enjoyed the competition and we look forward to welcoming you back next year. Preliminary accounts indicate that the tournament made a profit for the club of around £750 after netting out the Scottish Squash affiliation fee. This money will be used for future court repairs and maintenance. In addition, the squash bag raffle raised £65 for our Junior squash and the site’s tournament page, here, has been visited nearly four hundred times.